Cold soup in shot glasses can be served as a wonderfully refreshing summer appetizer or first course. Ginger is always very refreshing, so I use it often in summer dishes. Today, I made a cold carrot soup flavored with fresh ginger. I think the bright orange color is very representative of the season, especially enhanced by a touch a saffron. 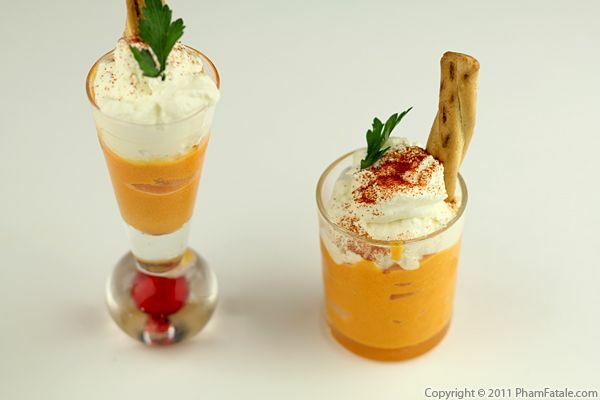 The carrots are cooked until softened, blended with a little cream until smooth, then chilled. I served the cold soup in individual glasses, which is an elegant start to any meal. To finish the dish, I garnished the soup with cumin-flavored whipped cream and a piece of candied ginger as a reminder of the flavoring inside.